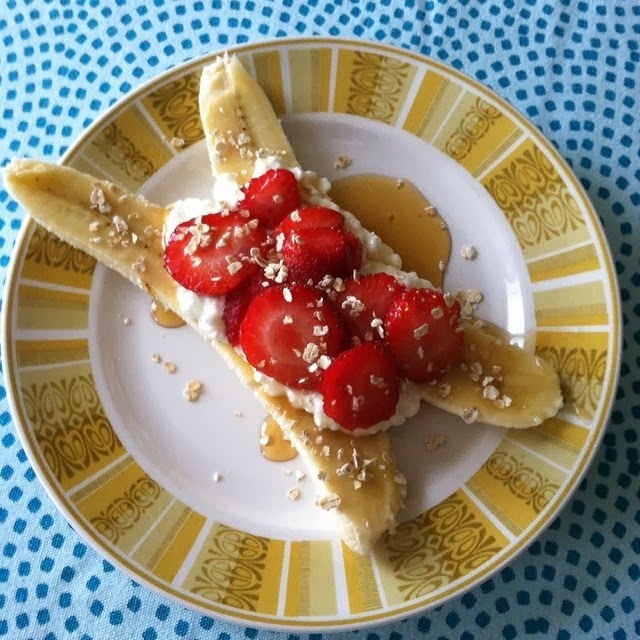 Flour Mayhem: Banana Splits for Breakfast! I normally enjoy a smoothie for breakfast, when I get tired of that I opt for some oatmeal. What happens when I am tired of both? Well, naturally I end up eating cookies with my coffee. That is either very good, or very bad. I decided it was very very bad, and then proceeded to look through my pantry and decide on a much healthier alternative. Thus the breakfast banana split was born. This is such an adaptable recipe, I promise it's such an easy, tasty, AND healthy breakfast, it'll become your go to morning meal in no time. You can really use whichever fruit you like, if you're not into cottage cheese, try yogurt, if you don't do dairy, there are many great non dairy alternatives, and I also like used whipped coconut cream. That's actually my new breakfast, banana, coconut cream, blueberries, and oats. SO good! 1/2 C cottage cheese, or yogurt, etc. Assemble as shown in the photo and dig in. You won't be disappointed.